Car free living in Reston? You bet. Reston not only has something to offer everyone--parks, recreation, fine dining, music and entertainment, work opportunities, and more--it's close to Washington, DC, Dulles Airport, mountains, lakes, and, well, everything. But what about public transportation? Is car free living in Reston possible? After all, Reston is technically a suburb. The answer is a very definite yes. Even before we knew the Metro Silver line would be coming to Reston, getting around without a car was easy. In fact, 12% of Restonians use a method other than car to commute to work--and that number will rise with the Metro. That includes using Reston's numerous walking trails (you can bike on them too). For those who like the idea of car free living in Reston, we boast a terrific bus system that will get you wherever you need to go--the Reston Internal Bus System (RIBS). 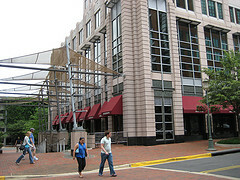 RIBS is a set of five routes that circulate around Reston, using the Town Center as a transfer point. They run frequently and reliably. Many of the routes stop at places where you can pick up the Fairfax Connector, should you need to venture beyond Reston. The fare system for both buses is the same, and you can find out more about the routes and fare by visiting the Fairfax Connector website. If you don't want to take a taxi to Dulles Airport, you can catch Metrobus service from the Herndon Monroe Park and Ride. And, of course, there are places to rent a car for a day if you want to take a day trip to explore the area. So, don't let your lack of a car keep you from exploring life in Reston. It really is easy to be car free in Reston!